Jeff Cooper once told me that, in the old days of training, half of a typical pistol class would be comprised of auto-loading handguns Typically Browning/Colt types. The other half, usually police officers, would be armed with revolvers. He said that this trend slowly began to change in the early eighties. By the time I attended his courses in the late eighties, it was rare to see a revolver-armed student. This trend was also seen in law enforcement. I went through my original Police Academy pistol training, back in the old days, with a revolver (S&W Model 67). The most common sidearm for many officers, at that time, was some sort of Smith & Wesson or Colt revolver, usually .38 Special or .357 Magnum. Today, however, you rarely see revolvers in the field, and then only in the holsters of older officers, usually just months from retirement. Most of the newer breed sport Glocks, Berettas, and other ultra-modern handguns. The feeling among many officers is that the wheel gun is obsolete. For many, its only true role is that of last-ditch backup in the form of a 2 Barreled .38 snobby. Is the revolver obsolete? Lets think about this. 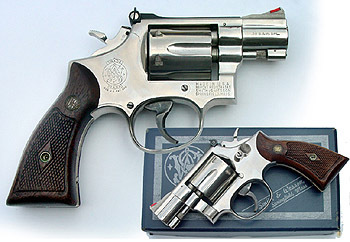 While, I am one of those who favors a modern handgun (Glock in my case), I am not so quick to dismiss a good revolver. The revolver is very effective as a fighting tool. All you need do to verify that is study your history. A fighting handgun, regardless of design, is intended for a specific mission. That mission, specifically, is to allow its operator to respond to unanticipated threats, quickly and in a powerful manner. That mission is the same today, as it was 50 years ago. These confrontations have always been characterized by high intensity, short duration violence, where so-called firepower is rarely an issue. Of greater importance is the ability to deal the adversary a solid and powerful blow, before he does the same to you. Most revolvers designed for anti-personnel use fulfill that mission as well as any other handgun, but no handgun is powerful enough to come with a 100% guarantee. Sometimes a follow-up shot or two is needed. So controllability becomes an issue. Many fighting revolvers are of the .38/.357 caliber family. This will do fine as long as careful ammunition selection takes place. Some .357 magnum loads, for example, are dramatically over-penetrative and exhibit excessive muzzle flash. Other loads, which are just as effective against humans, do not share the same characteristics of penetration and muzzle flash. Revolvers are also available in .40/.44 caliber. In my opinion, although larger than their 357 caliber cousins, provide a greater potential of creating damage to the adversary. Be careful with load selection again. It is a rare individual who can control a full-house .44 magnum in hammers and multiple target engagements. Don’t trust your life to magic bullet propaganda. A thorough study of the literature available from forensic specialists on wound trauma, and terminal ballistics should be your guide. While on the issue of weapon control, mention must be made of the stocks on a revolver (No, Grasshopper They are not called Grips). Many of the wooden stocks originally sold on revolvers were there as almost an after thought. This has changed in recent years as revolver manufacturers attempt to regain a share of the market. These weapons are now being sold with more suitable stocks from the factory. Whether you retain the factory stocks or purchase some type of after-market stocks, be certain that the left-side panel allows clearance for speed-loader insertion and manipulation. If this is not the case, either change them, or modify them. Additionally, any sharp edges or points on a weapon intended for combative use are to be avoided. Briskly rub your hands all over the revolver. Anyplace you find a sharp edge, remove it. Do this even if refinishing the weapon is needed as a result. This is not an issue with the stainless steel revolvers, but it may with a blue steel weapon. Skill requires practice, both dry and live-fire. This is something you’ll probably avoid if your gun tears up your hands so much that you need to keep some bandages and plasma around when you practice. Along with control, accuracy is of great importance. The two things on a revolver affecting this the most, assuming that everything is in working order, are the sights and the trigger. Revolver sights come in adjustable and fixed varieties. Either one is acceptable, as long as they are easy to see quickly under stress, and in dim light. Avoid any sights that are extremely high profile, or which have sharp edges. Again, sharp, hand-slashing points may be rounded off with a file. For those who operate in low light environments, tritium sights are available for many revolvers. The actual trigger on most revolvers is suitable as issued. It should not be excessively wide, nor should it have grooves or other additions on its face. Smooth and polished is the best type of trigger face. Remember, most combat revolver shooting will be done in double action, so a trigger that allows easy double action work is preferred. There is little that the individual can do in order to alter the actual weight of the trigger press. This is the realm of the revolver-gunsmith. Whatever you do, do not cut the springs on your revolver. If you wish a lighter, smoother trigger, you can have one, but there are no shortcuts here. Revolvers are issued with all sorts of barrel lengths. Again, keep sight of the mission. These weapons will be carried in and presented from a holster. A very long barrel will be slow and difficult to maneuver. Similarly detrimental, an extremely short barrel will sacrifice other mission requirements. A good compromise is something in the 4 inch to 6 inch range. Those are all the requirements of a fighting revolver. I have found that when compared to the auto-loading pistols, unless the test is slanted toward the auto-loader with excessive and unrealistic speed loading requirements, the revolver is just as useful. With proper ammunition, the revolver gives away nothing to the auto-loader in terms of terminal ballistics. The only area where it is surpassed by the auto-loader is when long strings of fire are faced, requiring constant reloading. Remember, however, that such scenarios are rare in the real world. Even when such problems arise, such as a North Hollywood Robbery type of incident, they are probably not going to get solved any better if you are equipped with an auto-loading pistol! No handgun equipped operator will do well in a rifle fight. The revolver skills that an operator must have to be effective are the same ones he would need if equipped with an auto-loader. Constant attention must be given to double action trigger manipulation. This is the heart of the wheel gun, so dry practice the DA trigger day and night. Along with this, manipulating Speed Loaders is of great importance, as is developing ability to maneuver individual rounds during tactical reloads. This is the only weakness of the revolver, so make allowance for that. In order to be the best you can be with the revolver, it is essential to seek out and obtain professional instruction. Is the revolver dead? In a word, no. I suspect that as we enter the next century, however, there will be very few revolvers in the duty holsters of police officers, or security personnel. For those who are required to carry it, or for those who favor its simplicity, the revolver will still allow them to do just as well in a confrontation as any space-gun, as long as the operator does his part. As we’ve always said, It is the man, and not the weapon which makes the difference.